The market of AIP systems is expected to show robust growth due to increasing need for safe and secure underwater military operations and demand for submarine modernization plans by the naval forces. Submarines are the most powerful vessel for performing underwater stealth operations such as anti-submarine warfare. During such secretive activities, submarines need to be silent in order to remain undetected from the enemy forces. Propulsion system plays an extremely important role in the functioning of a submarine for the completion of its desired operations. Majorly nuclear submarines are used due to their capability of performing extended operations. These propulsion system equipped submarines are expensive and generate a high level of noise which becomes a major threat. Therefore, diesel-electric submarines are used by several countries as they are silent and suitable for performing activities in littoral surfaces. Diesel-electric submarines have to get back on the surface to get fresh oxygen in order to recharge their batteries through diesel engines. This exposes such conventional submarines to the enemy radars and increases the chances of getting attacked. Air-independent populsion systems have been developed to solve the problem of getting the fresh oxygen from atmosphere. The AIP systems installed in the conventional submarines increases their underwater endurance and help them to avoid the need for resurfacing frequently. AIP systems permit diesel-electric submarines to recharge their batteries independent of their engines. Also, it helps to reduce the noise without compromising the submarine performance. AIP systems have been in high demand due to their increasing advantages in performing stealth underwater operations. This high scale of growth of AIP systems industry is subsequently influencing the market, wherein a new range of programs are being carried out to develop the latest AIP technologies. Globally, technology is one of the key drivers for its increased adoption by the government and the naval forces. There are mainly four AIP systems that have been developed including closed cycle engine, closed cycle steam turbines (MESMA), stirling engines and fuel cells. Out of all the developed AIP systems, stirling engines and fuel cells AIP systems are expected to grow during the forecast period. By analysis, global AIP systems market generated a revenue of $174.1 million in 2016. A detailed competitive analysis has been included in this report which focuses on the ¬key market developments & strategies, followed by the key players in the market. Additionally, a competitive benchmarking model has been included in the existing study which analyzes the market players based on competitive strength and geographical presence. Submarines have become the major weapon for naval warfare for carrying out sensitive undersea operations. There have been multiple efforts towards the development of more powerful and quieter submarines that could help in eliminating the risk of being tracked by the enemy radars. Conventional diesel-electric submarines produce lesser noise as compared to the nuclear submarines as they run on battery charge through electric engines. However, these submarines face some of the challenges related to the storage of batteries. For recharging their batteries, submarines need to get back to the water surface to get fresh oxygen in order to run their engines. Once the batteries are recharged, submarines dive into the ocean and silently perform the operations on battery power independent of the diesel generators. This whole process of recharging submarine batteries exposes them to the enemy forces and increases the chances of being detected. Therefore, there has been a continuous development towards increasing underwater endurance of diesel-electric submarines. As a result of which, air-independent propulsion systems have been developed. These propulsion systems help submarines to remain submerged without the need for fresh oxygen, thus, increasing their endurance. With various forms of innovations in the field of AIP technology, advanced systems are being developed that are extremely efficient and are cost-effective as well. 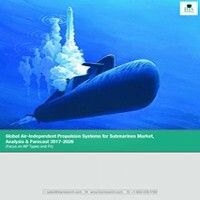 Based on the on-going developments in the field of different AIP technologies, the total market size of AIP systems for submarines was valued at $174.1 million in 2016. The market of AIP systems is expected to show robust growth due to increasing need for safe and secure underwater military operations and demand for submarine modernization plans by the naval forces. Saab, DCNS, ThyssenKrupp Marine Systems, Howaldtswerke-Deutsche Werft (HDW), Siemens and United Technologies Corporation, among others, are some of the major players of the AIP systems market. There are mainly four AIP systems that have been developed namely: closed cycle diesel engine (CCD), autonomous submarine energy module (MESMA), stirling engine and fuel cells. Out of all the AIP systems, stirling engine and fuel cell AIP modules are the most prominent systems that have been used in 2016 and is estimated to witness the higher demand during the forecast period 2017-2026. The fuel cell module market for AIP systems is estimated to generate the highest revenue during the forecast period. The AIP systems can be installed in submarines by two ways namely, line fit and retro fit. Retro fitting an AIP system into an old conventional submarine is a complex task as compared to equipping AIP systems into the submarine during its construction. Therefore, line fit AIP systems into submarines is expected to have the highest demand as compared to retro fit during the forecast period 2017-2026. Asia-Pacific is expected to have the highest market during the forecast period (2017-2026), followed by Europe and Middle-East. The increase in the demand for AIP systems in Asia-Pacific is due to the adoption of military modernization by various naval forces and the need for underwater security. Japan, China, India, Australia, Thailand, Singapore and South Korea are some of the prominent nations for the development of AIP systems. Moreover, China holds the largest fleet of AIP equipped submarines, globally. Europe is another leading region for implementing AIP technology into conventional submarines. The European region majorly consists of Germany, Sweden, Greece, Italy, Russia, Spain and Portugal in the AIP systems market. Moreover, there are ample opportunities for the new entrants in this region, as the demand for AIP technology is increasing for conventional submarines to enhance their endurance. Furthermore, Middle-East has recently showed its interest towards the procurement of AIP systems for submarines. Turkey is the most prominent nation in Middle-East that is keen to adopt the technology in submarines during the forecast period.